Our quality control methods for material and manufacturing processes ensure that all seals leaving our factories are in a condition capable of giving a long and reliable service life. 1. Specify piston and gland bearings which are adequately proportioned to support the cylinder loads.As a result of mounting misalignments and / or the working action of the cylinder, piston and gland bearings will be subjected to side-loading, causing damage to the rod or the tube surface and hence the seal, if the bearings are inadequate. 2. Ensure that seals are stored distortion free in a cool, dry and dark place prior to fitting. 3. Check that the seal housing is free from damage likely to harm the seal. Remove all sharp edges and burrs from metal parts, paying particular attention to ports, grooves and threads over or through which the seal passes during assembly. 4. Clean all seal housing areas, ensuring that all metallic particles and other contaminants have been removed. Check that other surfaces adjacent to the passage of the seal on fitting are also free of dirt, swarf or other contaminants. Check that both static and dynamic housing surface finishes meet specifications. 5. Where the difference between a thread diameter over which the seal must pass and the seal diameter is small, use some form of protection over the thread, such as a fitting sleeve made of hard plastic. 6. Check that the seal is of the correct type, part number and size, and that the specified material is correct. If there is any doubt regarding the material contact your local Hallite sales office. 7. Lubricate all seals and metal components liberally with clean operating fluid or a compatible grease prior to assembly. N.B. Silicone grease should not be used in normal hydraulic applications. 8. 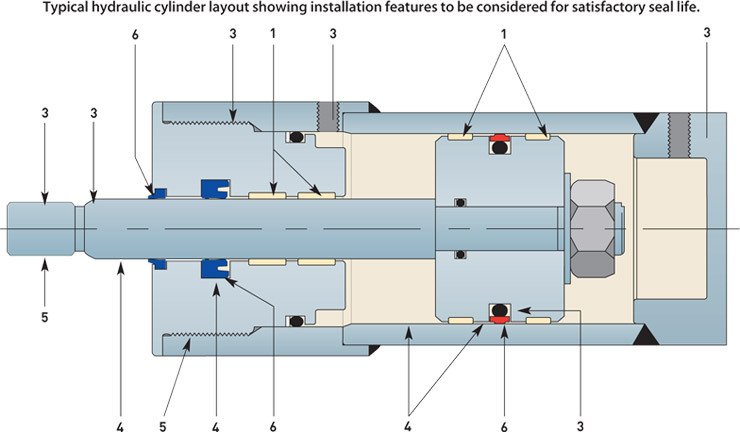 Where seals fitted to sub-assemblies, such as pistons, are awaiting further fitting operations, ensure that the seals are not subjected to any misaligned or localised loading which will cause local deformation. Ensure that sub-assemblies remain clean. 9. The use of metal levers is not recommended but should they be used it is imperative that they are completely smooth and free from nicks and burrs. When using them ensure that the metal surfaces adjacent to the seal are not damaged. 10. Flush the hydraulic system thoroughly before connecting the cylinder to it.